Wild cherry, sweet cherry, bird cherry, gean (Eng), cerezo (Spa), cirerer (Cat), gereziondoa (Baq), cereixeira (Glg), cerejeira (Por). 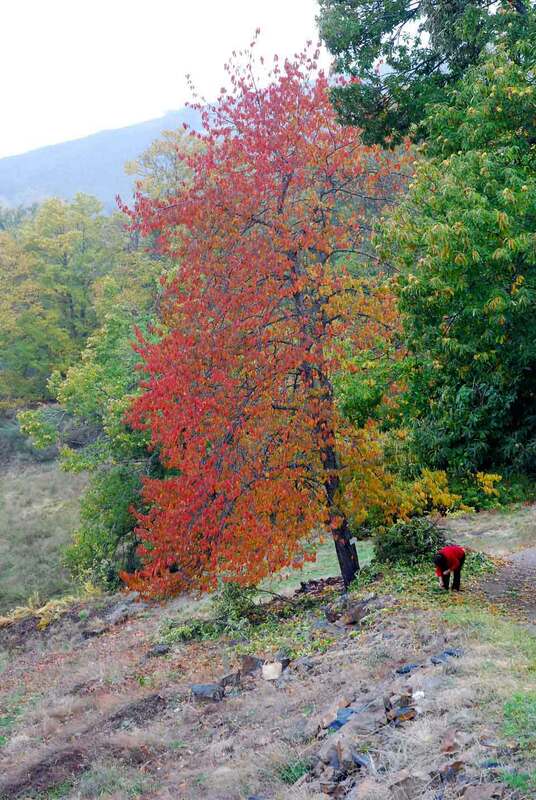 This is a tall slender tree that naturally reaches a height of 30 m, although cultivated specimens are not left to grow so tall, so that it is easier to collect the cherries. 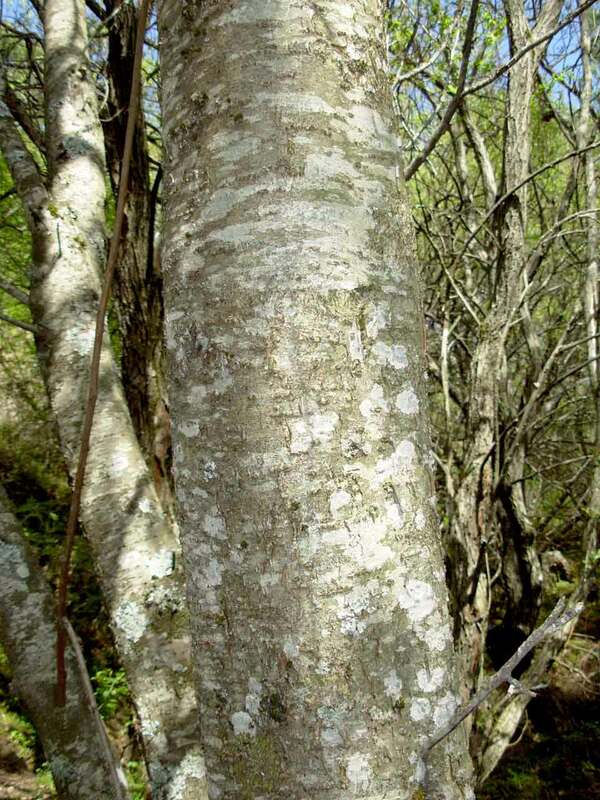 It has no thorns and the bark of the young trees is smooth and grey, characterised by horizontal grooves that sometimes peel off in papery transverse strips. The leaves are deciduous, simple, alternate (this character is best observed in the middle of the branches, because at the ends they appear very close together), and serrated. 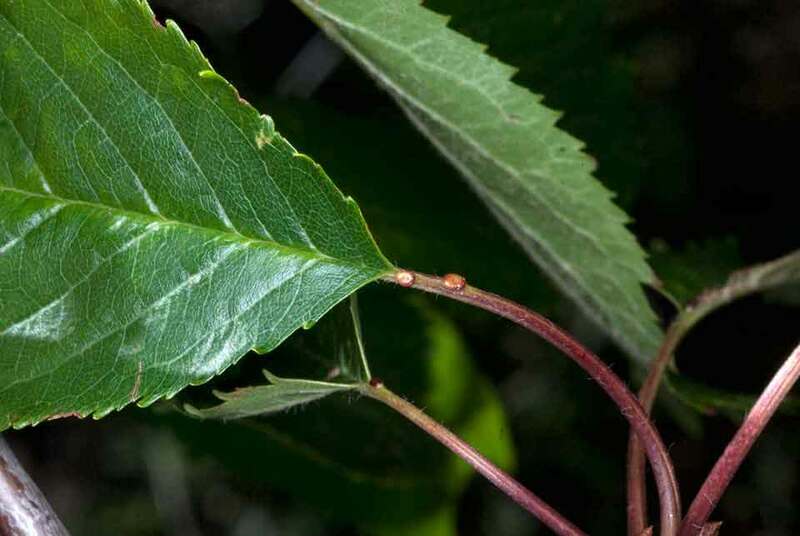 They finish in a narrow point and have a very long stalk with two reddish or blackish glands near the leaf blade. They are 6-15 cm long and 3-8 cm wide. In autumn their colour changes from green to ochre, orange and red. This gives the tree a characteristic appearance which is often what enables us to differentiate to this species in a forest's tree canopy. 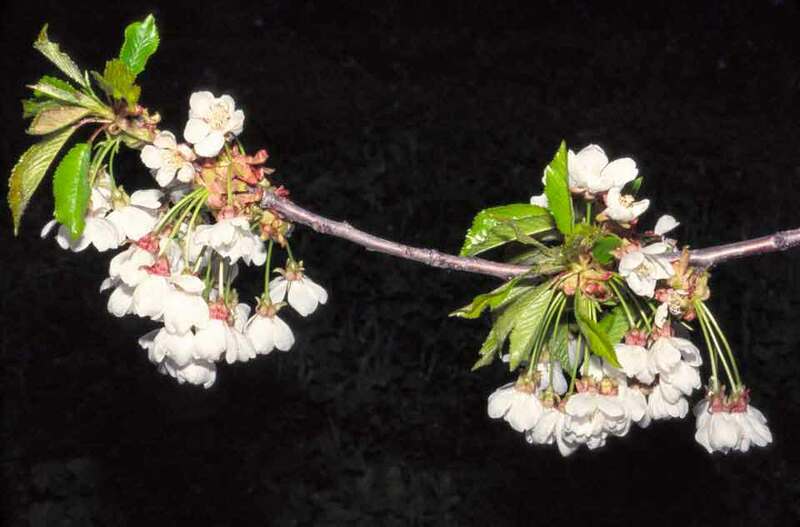 The flowers are white and develop in groups of 2-8. The fruits are cherries; they have a single stone inside and when they ripen they are smooth, shiny, and red, yellow or almost black in colour. They usually appear in hanging pairs held on by a very long stalk. Wild cherries are usually not as sweet as the cultivated ones, although they are full of flavour and rich in vitamins and mineral salts. The cherry tree lives in humid forests, being one of the species accompanying beech, oak, chestnut, and birch woodlands, for example. It lives in ravines and valleys, and is sometimes associated with water courses. It is indifferent to substrate as long as the soils are well developed. It grows from sea level to approximately 1500 m, although in the Sierra Nevada it reaches altitudes of 2000 m. Its fruits are a very important nutritional resource for many animals. 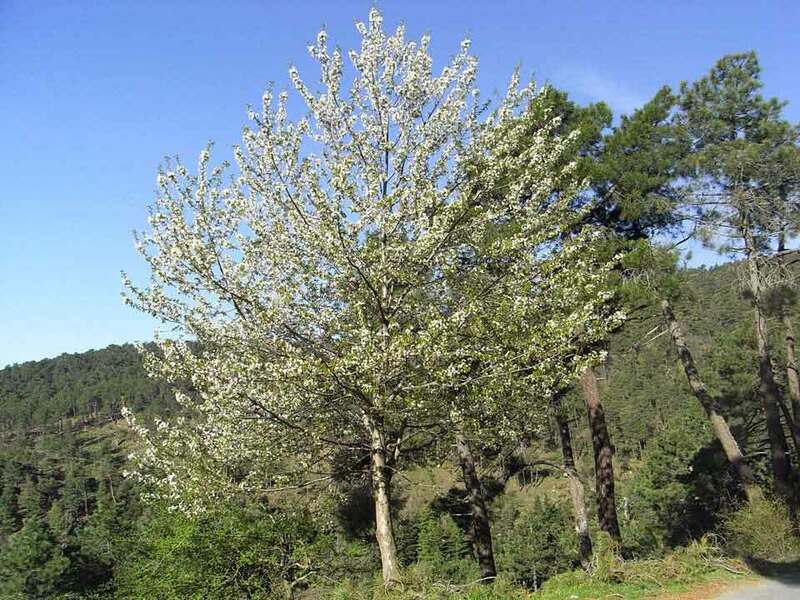 This tree occurs across almost all of Europe, western Asia and northern Africa, although its range has expanded a lot due to the fact that it is cultivated as well as becoming established in the wild easily. On the Iberian Peninsula it is more frequent in the north, and at lower latitudes it becomes an upland species. 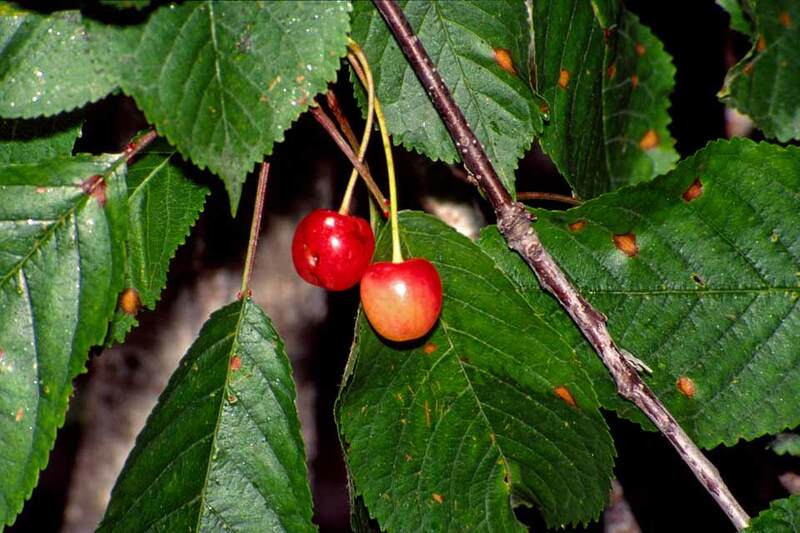 The cultivated cherries from the Jerte valley, in Cáceres, are very well known.